Description: Heading into Northumberland Yard to do some work, back when CN's ran on this and when it ran up the Buffalo Line! 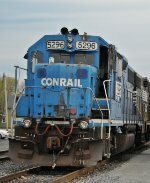 Description: A GP38-2 still in Conrail paint pulls by an ex-Southern Pacific SD45. Description: It was under power in the consist. Description: Seen lead an NS SD80MAC #7211 on NS 13G northbound train approached thru Olin Dill rd. Description: The Air Products train heads east through Phillipsburg at 1:59PM behind a pair of ex-Conrail GP38-2s. Title: NS 5296 CSX W982-18 "High & Wide"
Description: On CSX Trenton Line, inching by parked wells on the Skillman Siding. Load: Heat Exchanger (to Democratic Republic of Iraq). 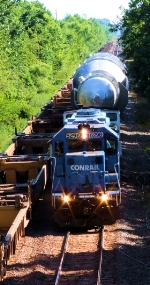 Per the Air Products crew, the heat exchanger was supposedly 965,000lbs at 15'9". The locomotive eventually cut away to move some of the parked equipment because of clearance issues. 0930 hours. Description: W982 crossing Edgewood Rd.